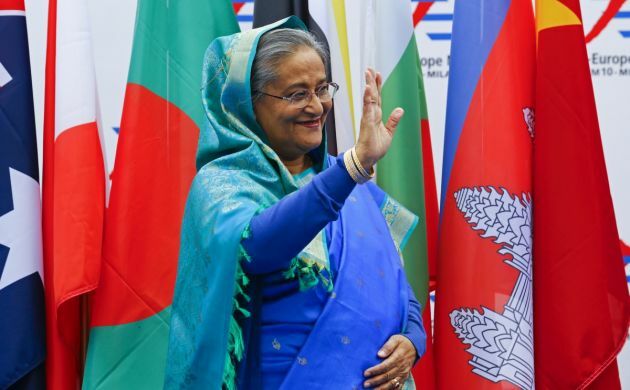 (Photo: REUTERS / Stefano Rellandini)Bangladesh's Prime Minister Sheikh Hasina arrives for the Asia-Europe Meeting (ASEM) in Milan October 16, 2014. For Bangladeshi Prime Minister Sheikh Hasina some sectors of society deliberately misinterpret religion and its certain beliefs and practices to stop women from progressing in their respective communities. In remarks she issued on the occasion of the International Women's Day in Dhaka, the Bangladeshi capital, Hasina cited Islam as an example, saying that some people overlook the spirit of the religion in guaranteeing the rights of women. "There are some who want to confine women in the name of Islam," the prime minister, the Bangladeshi website bdnews24.com reported. "What they forget is that Islam which has ensured women's right." Islam as a religion has never hindered the progress of women, the prime minister said, explaining that any deterrent to women's roles in Islamic societies is a clear misinterpretation of the meaning of the religion. She cited the case of Khadija bint Khuwaylid, a woman considered to be the first convert to Islam upon the call of the Prophet Mohammad. Khadija had been the first wife of the prophet. "The first martyr for Islam was also a woman," Hasina continued. "So, it's Islam which has ensured rights for women and we need to keep that in mind." The prime minister castigated a coalition led by the Bangladeshi National Party (BNP) for spearheading violence to stoke political unrest in the country. "It makes me sad, when we see our country is progressing in every realm, earning a reputation in the global arena, and the once opposition leader is neither in parliament nor in the government," the prime minister said. "She tried to stop the polls, but failed. And now, she has come up with a movement," she added. She urged Bangladeshi women to oppose such actions, particularly burning people alive. The prime minister accused the BNP for the crimes, vowing to put the leadership to trial.